Annuals, 10-60(-150+) cm. Stems erect. Leaves opposite (proximal) and alternate; petioles 25-35(-60+) mm; blades deltate to lanceolate or elliptic, 25-55(-90+) × 20-30(-50+) mm, 1-2-pinnately lobed, bases cuneate, ultimate margins entire or toothed, abaxial faces sparsely pilosulous to strigillose, adaxial faces strigillose, both gland-dotted. Pistillate heads clustered, proximal to staminates; florets 1. Staminate heads: peduncles 0.5-1.5 mm; involucres shallowly cup-shaped (usually without black nerves), 2-3+ mm diam., glabrous or hispid to pilosulous; florets 12-20+. Burs: bodies ± globose to pyriform, 2-3 mm, ± pilosulous, spines or tubercles 3-5+, near middles or distal, ± conic to acerose, 0.1-0.5+ mm, tips straight. 2n = 34, 36. Flowering Jul-Oct. Wet to dry soils, disturbed sites; 0-1000+ m; Alta., B.C., Man., N.B., Nfld. and Labr. (Nfld. ), N.W.T., N.S., Ont., P.E.I., Que., Sask. ; Ala., Alaska, Ariz., Ark., Calif., Colo., Conn., Del., D.C., Fla., Ga., Idaho, Ill., Ind., Iowa, Kans., Ky., La., Maine, Md., Mass., Mich., Minn., Miss., Mo., Mont., Nebr., Nev., N.H., N.J., N.Mex., N.Y., N.C., N.Dak., Ohio, Okla., Oreg., Pa., R.I., S.C., S.Dak., Tenn., Tex., Utah, Vt., Va., Wash., W.Va., Wis., Wyo. Hybrids between Ambrosia artemisiifolia and A. psilostachya have been called A. ×intergradiens W. H. Wagner. 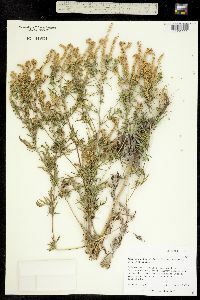 The name Ambrosia ×helenae Rouleau applies to hybrids between A. artemisiifolia and A. trifida. I am referring all of our reports under whatever name reported to this species. As Jones has pointed out, it is a highly variable plant, producing pistillate plants and also plants bearing both stamens and pistils. An abundant weed everywhere in cultivated and fallow fields, waste places, roadsides, and almost any place where the ground is not covered with a sod of grass. Milch cows are usually kept out of pastures and stubble fields where it is abundant because when they eat this plant the milk has a nauseating taste. The ragweeds are a few of the species whose pollen causes autumnal hay fever. On account of the abundance of these plants they have the credit of being the chief cause of this disease.